A University of Wyoming Excellence Chair has received a Department of Energy (DOE) grant to study how to improve the predictability of mixed-phase clouds and aerosol interactions at high latitudes. The grant, announced earlier this month by the DOE’s Office of Biological and Environmental Research, begins Sept. 1 and runs through Aug. 31, 2021. The grant will fund one postdoctoral researcher and two Ph.D. students, Liu says. As the project title suggests, Liu will look at improving the predictability of mixed-phase clouds and aerosol interaction at high latitudes. Mixed-phase clouds are a type of cloud in which both liquid droplets and ice crystals co-exist, Liu says. These clouds occur frequently in high latitudes and affect surface temperatures. While important in the climate system, the understanding of mixed-phase clouds at high latitudes is still limited, he adds. Liu will seek to determine whether a Global Climate Model (GCM) can reasonably simulate the mixed-phase cloud properties as well as their differences between northern and southern high latitudes. If not, Liu wants to determine how the representations of ice nucleation and convective transport and scavenging of aerosols affect the simulations of aerosol and mixed-phase cloud properties through coupling with dynamics and radiation. He also wants to determine what role seasonally varying aerosols play in the different mixed-phase cloud properties between northern and southern high latitudes. Liu has received numerous awards and honors, including Pacific Northwest National Laboratory’s Exceptional Contribution Program Award and Outstanding Performance Award; the World Meteorological Society’s Young Scientist Award and its Mariolopoulos-Kanaginis Award (honorable mention) for papers in atmospheric environmental research; the Alexander von Humboldt Research Fellow at Fraunhofer Institute for Atmospheric Environmental Research, Garmisch-Partenkirchen, Germany; and he was elected into the “100 Talent Program” of the Chinese Academy of Sciences. 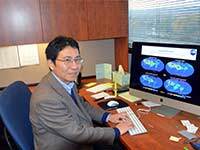 Liu also currently heads up a research project where he uses the National Center for Atmospheric Research (NCAR)-Wyoming Supercomputing Center (NWSC) in Cheyenne. He leads a National Science Foundation-funded study that investigates the dust-climate interactions and the role of these interactions over the past century. For more information about Liu, visit his faculty website.